At EFF, we keep very, very busy. Our past is invariably tangled with the present—long-running court cases that stretch on for years, and hard-won battles that it turns out we have to re-visit. We kicked off 2016 with a blast from the past—the latest salvo in the Crypto Wars—and, along with the rest of the country, entered a new era in November. We've been moving at top speed ever since. Every once in a while, though, it's wise to catch our breath and remember why we fight as hard as we do. 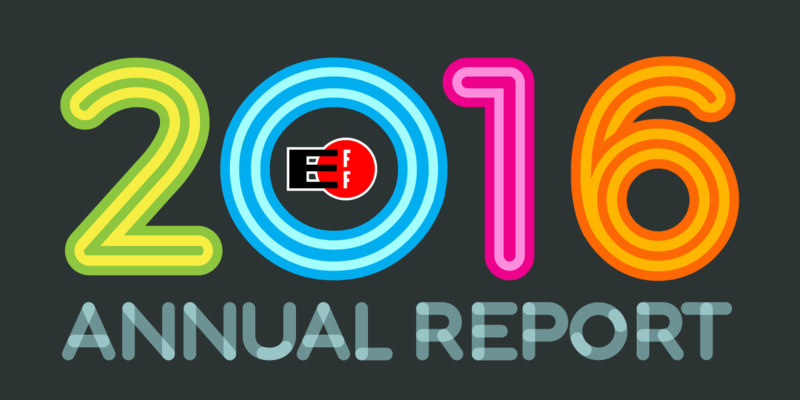 Our 2016 Annual Report includes reflections from several EFF staff members on the work we do, and why we do it. In looking back, we look forward with fresh resolve. We hope you will, too.